Almost every day we are all treated to a chaotic chaotic formalin food that is suppose to give effect to the onset of cancer problems and other health hazards. 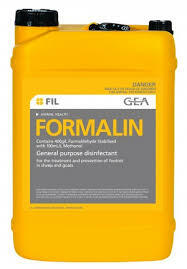 In order not confusing let us discuss with friends, formalin is actually the name of the chemical substance consisting of a mixture of formaldehyde, methanol and water, so it is often used as a preservative corpse. But lately the use of formalin is used as food preservatives such as fish meat and the result will be preserved meat or fish did survive for a long time due to the ability of formaldehyde that can kill microbes or germs germs small role in the process of decay. For embalming, clearly the use of formalin will be very helpful, because the corpse would not decompose faster, why the bodies preserved? in some cases, bodies are necessary for research such as anatomy lab that uses the body as lab materials. The use of formalin in the encounter in many types of food noodle, fresh fish, salted fish, tofu, etc.. The difference between food that formalin is not with the appearance of this food look more supple, more shiny, more clay and are not surrounded by flies even after several days. Case hottest that lately a lot of the talk about a milk formalin which is enough to make the circle of mothers worry. If you frequently eat foods that formalin then over time will cause irritation to the stomach so the blood can cause vomiting, or diarrhea mixed with blood, urine or blood and could also potentially cause death. The most common is chronic poisoning that damage our kidneys are organs that can cause cancer later on.